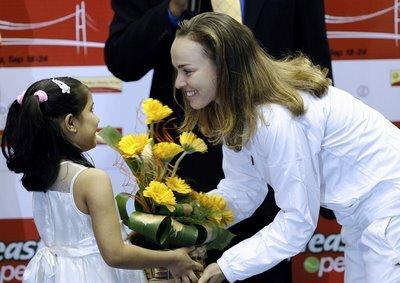 Vidhyut's Nuggets: Hingis at Sunfeast Open final presentation ceremony. Hingis at Sunfeast Open final presentation ceremony. After surviving some battles during the week, one of the world's best took it up a notch over the weekend in Kolkata. Martina Hingis silenced a rowdy Indian crowd in the semifinals with a 61 60 demolition of national heroine Sania Mirza, then Sunday blitzed unheralded Russian Olga Poutchkova, 60 64, for the Tier III title. After a string of upsets early in the week on the bottom half of the draw, it was the unseeded, 85th-ranked Poutchkova who emerged as Hingis' final opponent. Contesting just her fifth Sony Ericsson WTA Tour-level main draw, the 18-year-old was given an opportunity to play one of her idols in her career-first final, which she commented on before the championship bout. "It's amazing to me," Poutchkova said. "I used to watch her in Grand Slam finals when I was 12 and now I'm going to play her. We'll just have to see how it goes!" But Hingis held tightly to her top billing Sunday evening, easing through the first set and overcoming a spirited challenge from her opponent in the second, rallying back from a 3-1 deficit en route to capturing her second title of the season. "I played very well; the first set was almost scary," Hingis stated. "When you play a set like that, you can lose concentration. In the second she started playing my forehand and I was surprised, but I started to adjust. She managed to get to 3-1 before I got my concentration back. I stepped up when I had to. "She's a great young player." "It was my very first final and it was against Martina Hingis," Poutchkova said afterwards. "I was a little bit nervous, but I feel good about the experience. In the second set she gave me some chances, then she took them away!" The Sunfeast Open title marks Hingis' 42nd Sony Ericsson WTA Tour singles title, augmenting her finals record to 42-24. She won her 41st at the Internazionali d'Italia in Rome, and now becomes the 14th multiple titlist this season. "As this is my first win in India, it makes the win even more special," said Hingis, who was actually playing her first career tournament in the Asian nation. "I'm very happy with my comeback year. Getting to the Top 10 was a dream and the next dream is making it to the Sony Ericsson Championships in Madrid." It was the second straight day that Hingis would silence an anxious, excited crowd. In her highly-anticipated Saturday semifinal against Indian icon Sania Mirza, seeded No.5 at her home event, Hingis dropped just one game in cruising to victory in less than an hour, a contrast to their only prior encounter, a tight two-setter in Dubai this year. "I felt like she knew where I was hitting the ball before it even left my racquet," said Mirza, who was playing her first semifinal of the year. "She's a great athlete and a great mover on the court. There are only a few girls as fit as her on the Tour. She's a natural athlete. Like Federer, she makes the game look effortless." "She did have a couple of chances in the second set," said Hingis afterwards, "but it's not easy for her playing at home, with the pressure and expectations." There was some solace for Mirza in the end, however. She and Liezel Huber went on to win the doubles title with a routine 64 60 win over Yulia Beygelzimer and Yuliana Fedak in the final. Huber and Mirza, the top seeds, had already claimed two titles as a team, both on Indian soil, at Hyderabad two years ago and earlier this year at the brand new Tier III event in Bangalore. "It's great to win here with Liezel, my mentor," said Mirza, now 3-3 lifetime in doubles finals. "Playing with an experienced player makes all the difference." "We put the pressure on early, which forced them to keep trying for something extra, and then mistakes were made," added Huber, who is now 15-14 lifetime in Tour doubles finals. "The second set was not as easy as it looks from the score." Another story with somewhat of a happy ending this week was a return to form for one of the world's former 20 players, Iroda Tulyaganova, who, after missing most of the last three years with an elbow injury and coming into this event ranked outside the Top 300, stormed through the qualifying and made it all the way to the semifinals of the main draw. Not so bad for the 24-year-old Uzbek's first Tour event of the season. "I qualified and reached the semifinals, which is a fantastic result for me," stated Tulyaganova, a three-time Tour singles titlist who went as high as No.16 in the world and has beaten Kim Clijsters, Justine Henin-Hardenne, Elena Dementieva and Mary Pierce, among other marquee names. "It gives me a lot of confidence for the future."